Ready to run – can we go now? Please? Why must I wait?? Patience is a virtue I could probably do without. Waiting is definitely one of the hardest parts. I am probably particularly bad at waiting, given that I am a ridiculous planner. I have the next four months planned out, and probably some key weekends in the months following that. It’s what I do and who I am, and I love my calender for that reason. But having to wait for something you’ve been anticipating greatly for the past 18 weeks is especially hard. And I am growing more impatient by the second! My last few runs have felt really great leading up to the Colfax, so I am hopeful race day will be more of the same! I’m so thankful for the Highline Canal – my favorite training trail! 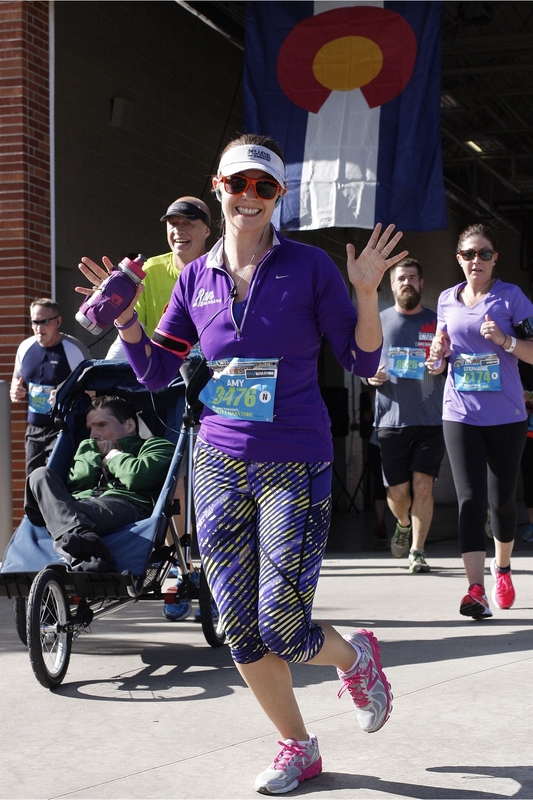 The Colfax Marathon, Denver’s currently only marathon, takes place this Sunday. Come 6:00am MST I will be (hopefully) ready and raring to go! Since January when I committed myself to training for this race, it’s seemed like such a distant dream, and almost unattainable. With my longest training runs behind me, and the longest run of my life ahead of me, I just want to be in it and doing it. 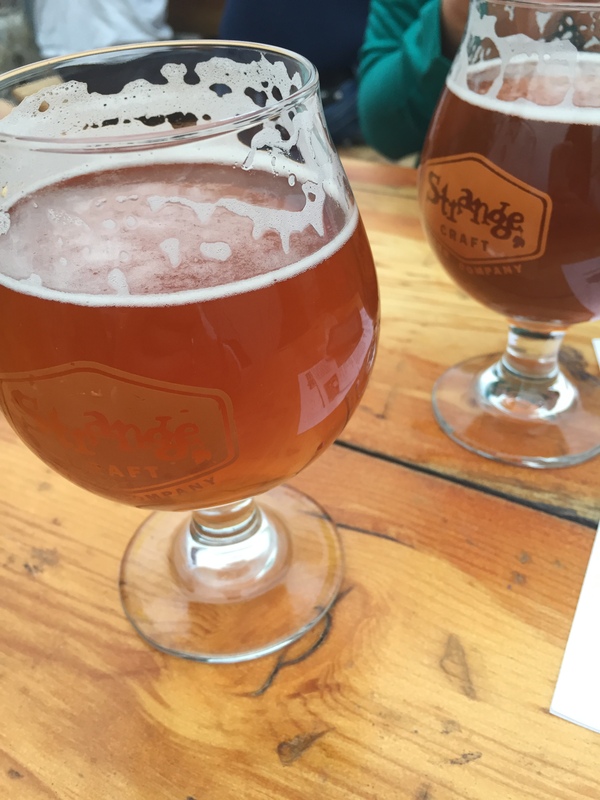 We always discover new places when my parents visit – Sanitas Brewing Company was so good! weeks ago my parents were in town while my dad attended a conference in Broomfield, Colorado. Work has been picking up with the semester ending and new student orientation sessions. I spent this past weekend celebrating one of my bestie’s birthdays by participating in the Homerun for the Homeless 5K, and I also celebrated one of my running buddy’s upcoming nuptials. Thankfully these have all combined to be nice distractions, but now that it’s the week of the race, it’s all I can think about. The Homerun for the Homeless 5k ran right through Coors Field, the home of the Rockies! 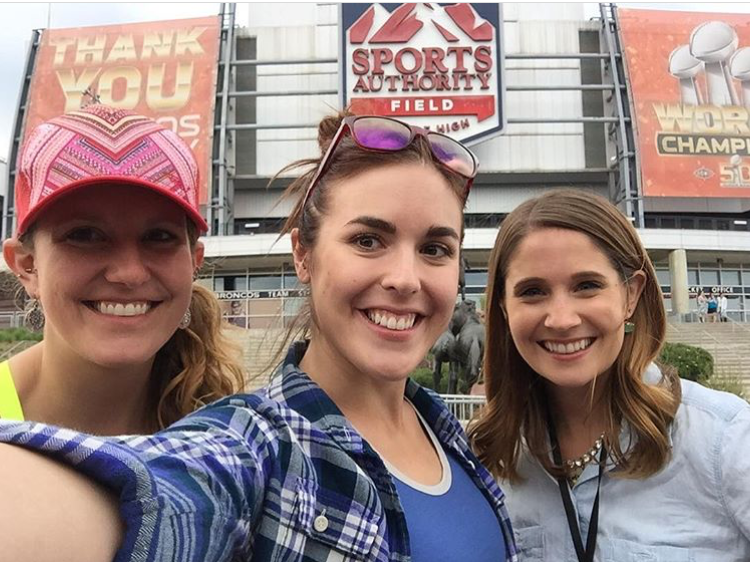 This weekend I’ll be running through Mile High Stadium – home of the Super Bowl Champion Denver Broncos! Feeling good and cannot wait to crush Colfax! I suppose it’s not a matter of whether or not I can do it at this point. I feel good, my body is strong, I am fueling it well, I could always use more sleep, I’ve incorporated cross training, and I have the miles in me. Now it’s just putting all the pieces together on race day. You never know what each race day will be like, but all you can do is prepare yourself as much as possible and stay positive. That of course doesn’t mean I won’t hit a wall or think about stopping. But it does mean I have to push myself beyond those negative forces and know that I can do it. I am so blessed that I have had so many amazing people cheering me on throughout this process, from my closest friends and family, to complete strangers. Some of my favorite moments included a mid-week lunch run high-five from a random passerby on the trail, to finally meeting one of my Instragram runspirations for a weekend run, and all the moments in between. As I pick up my packet (and hubby’s too) later today, I think it will finally hit me that this is real. I’ve been a bundle of nerves all week, but knowing it’s happening will likely make me feel better. I cannot guarantee this Sunday will be the best race of my life, or even in the top ten. What I can guarantee is that I will try my hardest. I will strive to endure and cross that finish line. And no matter what, I hope to become a marathoner. Anyone else running a marathon this weekend? 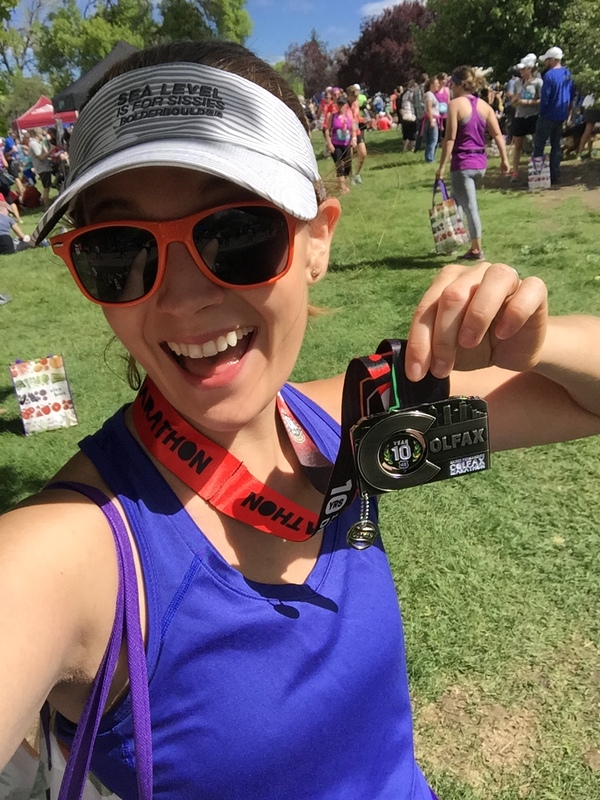 Any recommendations for a first time marathoner? What do you do to prepare for race day? 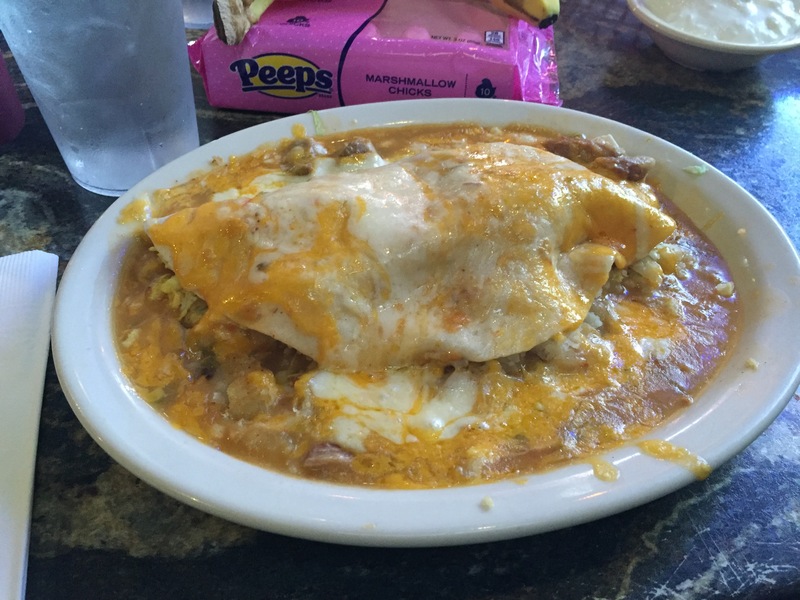 What is your favorite post-marathon meal (can you tell I am always hungry?)? 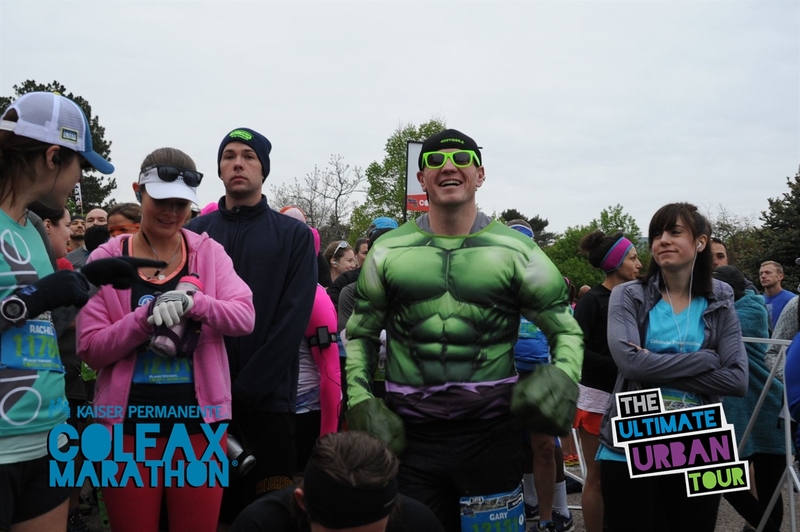 It’s hard to imagine that the Colfax Marathon is in 16 days – just two and a half weeks from now. It feels like the last 15 weeks have simultaneously flown by and trudged slowly on. My 18 week plan is nearing its end, and I never thought I would really make it to this point. After finishing 20 miles, I felt like I could conquer the world! Last weekend, one weekend off of my original plan, I completed my longest run to date – exactly 20 miles. What an incredible sensation to see double digits starting with a 2 on my Garmin. To say it’s been a long road would be incredibly accurate, and also quite literal. When I first began running in 2013, I could barely run a full mile without stopping, and it was well over a 10 minute per mile pace. Now, I can easily run a 10k in less than an hour. To actually see and feel that kind of progress is just mind-boggling and humbling. Every step I take brings me one step closer to my goal. And after May 15th, who knows what new goals I will set for myself. Over the past two weeks I might have been a little overzealous. The weekend I was originally supposed to run my 20 miler Denver got a lovely spring weekend snowstorm. While the city itself didn’t get much accumulation, where I live we had 8 inches of snow and slushy-icy roads. At this stage of the game, I absolutely don’t want to risk it, so I had to forgo running that weekend. Instead I planned to fit it in the following weekend. 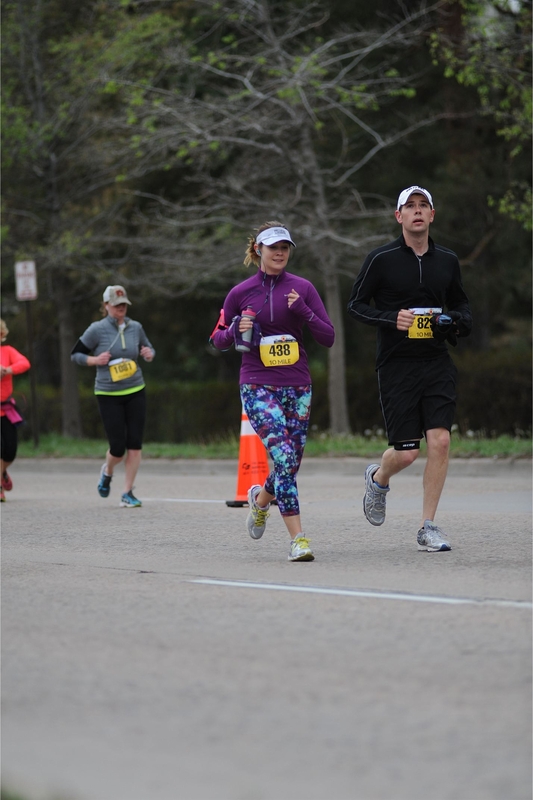 Here’s the challenge: I had already planned to run the Cherry Creek Sneak 10 miler and was participating on behalf of CU Denver, my employer. It wouldn’t be good to back out, but how could I fit in 20 miles? The rational answer would be to run the race, and fit in another 10 miles that day. Of course, it makes sense. Your body still gets 20 miles in a day, so it applies towards the mileage you need to complete. Well, why would I do something that makes sense? 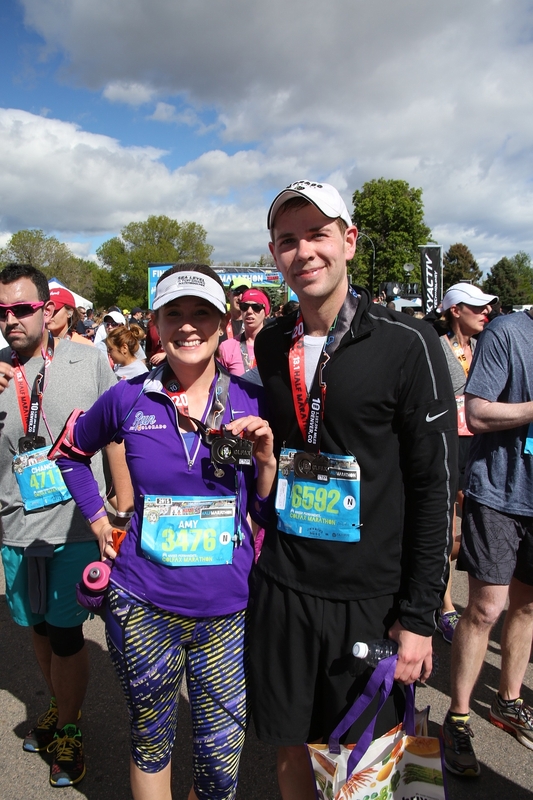 When I asked the hubs what he wanted to do, he said simply, “Why don’t we run 20 miles on Saturday and then the 10 mile race on Sunday?” 30 miles, one weekend. Challenge accepted. There is something about hitting your longest run before the race that seems so surreal. I’m really bananas for bananas… It’s a problem. A delicious problem. It’s absolutely a mental game by that point. If I can run 18 miles and feel amazing, I can absolutely run 20 miles. It’s not much further, and what’s left is proper fueling, rest, stretching, and mental preparation. Going into the run, I knew I wanted it to be done, but more importantly, I wanted to feel good. I have been using Gu Vanilla Bean and Clif shot bloks during my runs, and that seems to get me through. I still daydream about bananas by mile 12 (if you don’t know, I have a banana obsession…), but it could be much worse. Thankfully I also have a great training trail, the Highline Canal Trail, which spans 71 miles across the front range and has an entrance conveniently 0.8 miles from my front door. It’s also a great trail as it has very few street crossings, and some conveniently located bathrooms en route (wow have those come in handy). I won’t ever say that 20 miles is easy, but I completed those twenty miles with a respectable 10:34 pace, and generally felt good. Now waking up the next morning and realizing I had to do half of that was another story. Last year’s race was significantly soggier. 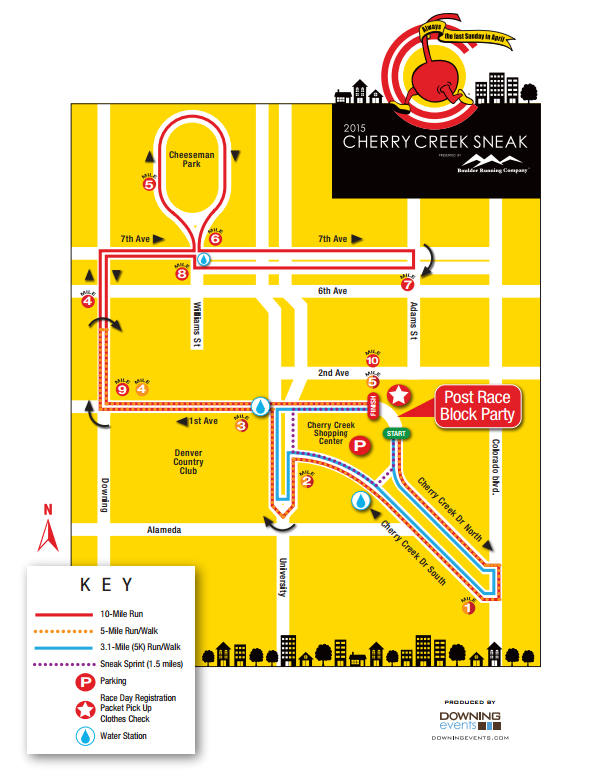 The Cherry Creek Sneak is an awesome local race that features a 1.5 mile fun run, as well as 5k, 5 mile, and 10 mile distances. When I signed up I assumed this would be the beginning of my tapering, so 10 miles made the most sense. 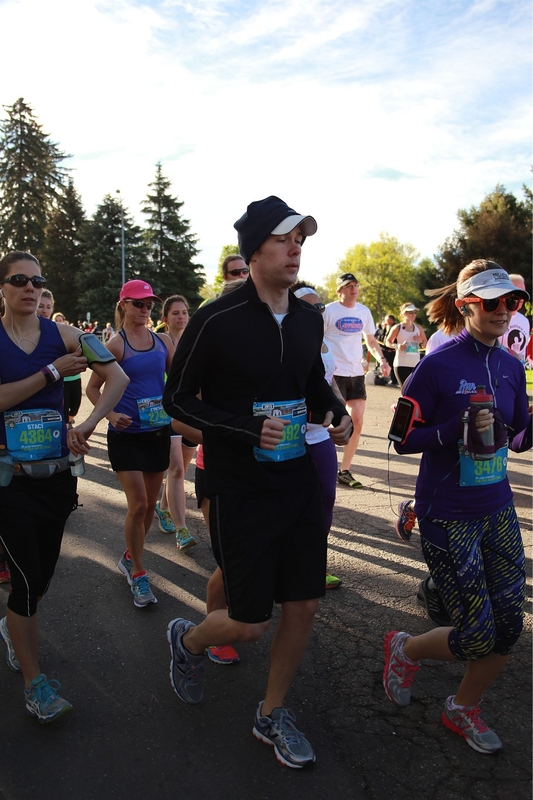 The 10 mile race began first at 7:30am in the Cherry Creek area of Denver. I ran this race last year, and thankfully, there was no rain and the weather was true perfection. I arrived about 10 minutes before we were set to begin, which was perfect for this type of local race. Just enough time to get psyched, but not enough time for my legs to get cold and tight. A runner on a mission. I really love this course. The race begins just off of 1st Avenue in the heart of Cherry Creek, heads to the east towards Colorado Boulevard, and then veers back towards 1st Avenue to then connect with Downing Street. The 10 miler takes runners through Cheeseman Park and has a decent stretch along 7th Avenue, before heading back down Downing and ending along 1st Avenue. The race went smoothly enough, and I finished in 1:41:33 with a 10:09 pace, which included a stop on course to take off my long sleeve cover up. In less that 24 hours, I ran 30 miles. The real victory? I can still walk (and run!) and I am not sore. I will take that, and dare I say, run with it. Don’t you just love that feeling? All that’s left at this point is another 10k between me and my (current) ultimate goal of finishing my first marathon. I really never imagined I would ever do one, nor could I have imagined the incredible work that goes into training for one. But here I am, a mere 16 days away. Just me and another six point two to victory. How many miles has been your major goal? Ever attempted back to back long runs? What are your favorite recovery tricks? How is your marathon training going? I cannot get over the crazy hair! Why did no one ever tell me about real runger? I admit, I should have known that marathon training would require significantly more sustenance to keep me going, and fueling is always really important when training for any athletic endeavor. But I am hungry. ALL. THE. TIME. Don’t get me wrong, I love food, and I especially love good, nutritious, and well-balanced food. I am simply not used to eating this much food out of necessity. I have been doing a lot of research recently to understand what I should be doing to manage my hunger and ensure I am still fueling properly and thoughtfully. It is true, I did indulge in a donut last week, but otherwise I am really trying to maintain and healthy balance between good carbs, fueling proteins, healthy fats, and lots of fruits and veggies. I have to accept the fact, however, that marathon training isn’t designed for weight loss. Maintenance, sure, but not weight loss. At least I will be toned all over! No really, I feel like I am always hungry. 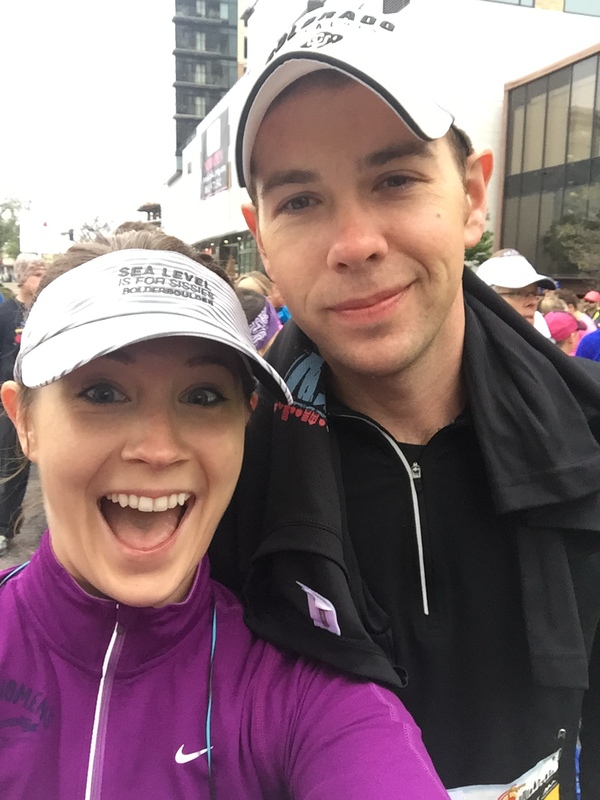 In my quest for runger enlightenment, I stumbled upon Amanda Brooks’ blog “Run to the Finish,” in which her “Ultimate Guide to Managing Marathon Hunger” has been a huge life-saver and healthy reminder. 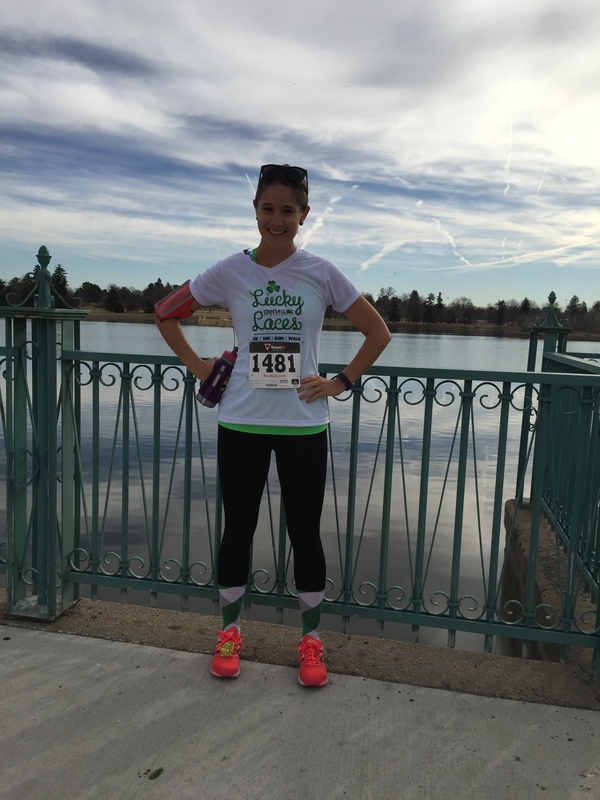 In it she provides her top 10 tips for managing marathon training hunger, which is exactly what I was needing. I’ll list them below, but please check out her post – it’s hugely helpful! 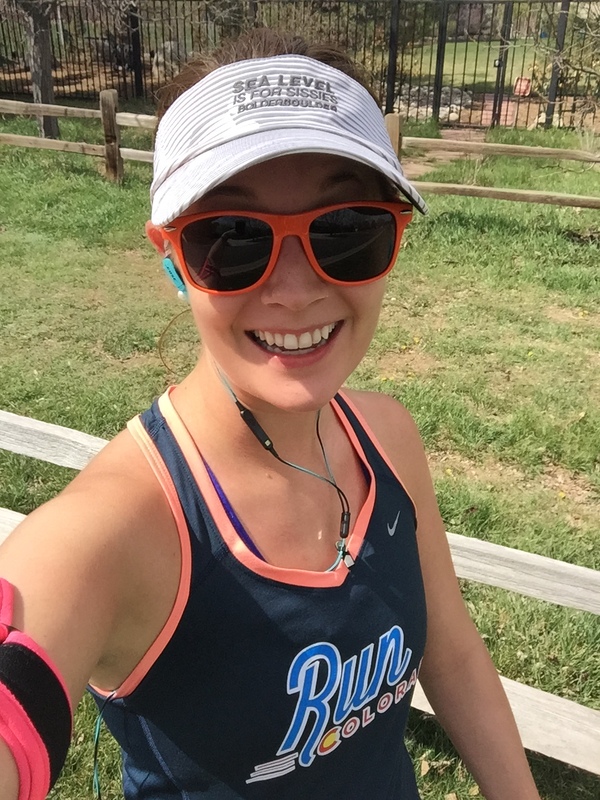 Amanda recommends refueling immediately after a run with a recovery drink. I am a huge fan of green smoothies, so this has been a really useful reminder for me that I need to intake my smoothie sooner. If you haven’t heard of “Simple Green Smoothies,” you should check them out now. They have tons of free recipes on their site and through social media, and their book is outstanding. The book provides smoothies for all different purposes, including recovery. 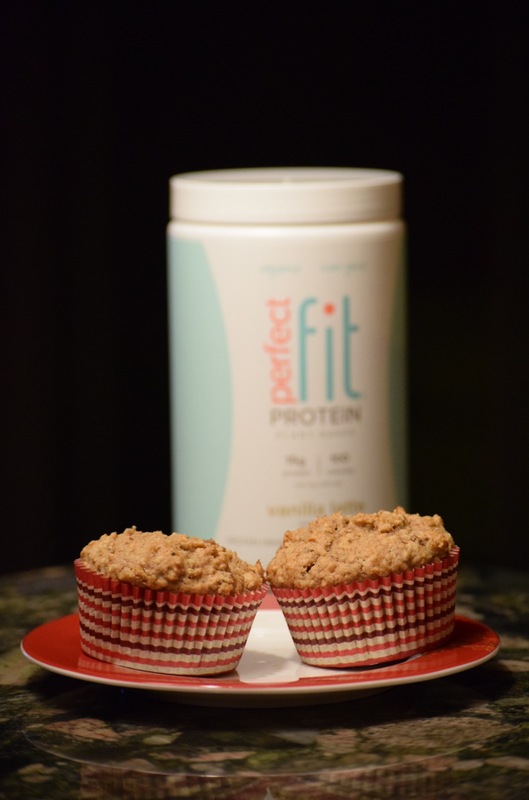 Did I mention that these GF oat muffins are also great with Perfect Fit? whether through eggs, quinoa, lentils, chickpeas/hummus, etc. One of my favorites is cooking an egg and preparing half a cup of Love Grown Foods’ Simply Pure Super Oats, which incorporates quinoa and chia seeds. I also sometimes top the oatmeal instead with a banana, half cup of blueberries and 5 strawberries, or you could even mix in your favorite nut butter. I also love smoothies with Tone It Up’s Perfect Fit Protein, a great plant-based vegan protein powder. I am going to quote Amanda here, “Don’t fear fats”! And it’s true, but choose healthy and hearty saturated fats, like coconut oil in smoothies or when making eggs (which also helps enhance your energy levels) or avocados, also in smoothies or with lunch or dinner. I am going to try this shrimp and avocado salad tonight for dinner, so you know that other half of avocado is going in my morning smoothie tomorrow! Do not wait too long to eat after your run, because this can lead to overeating. There are some days where I will grab a big bottle of water and make my recovery meal right after I return so I don’t get too rungry. Amanda also mentions incorporating 2-3 snacks throughout the day, so in essence you’re eating about 5 or so “meals” on a daily basis as needed. Often I will go for bananas with nut butter, carrots and hummus, or a smaller green smoothie. Carbs are friends, not foes, as long as incorporated properly. Complex carbohydrates are the key, which you can get from veggies and whole grains. Quinoa and oats are some of my favorite things, and even in baking I am turning to whole wheat and gluten-free flours, like oat flour. Amanda provides useful links to carbo-load correctly, so it’s worth checking out. Controlling your sugars is essential. Although last week’s chocolate frosted donut was a real treat, I was aware that it was not adding any value to how I fuel my body. Sugar has a sneaky way of making you feel hungry even if you aren’t, which can cause overeating. When you’re already consuming more calories than normal, this is a very slippery slope you want to avoid. What else can I say? Sleep is so imperative for everything, really, and even more so when training. This is definitely an area of improvement for me. Sleep can help balance your metabolism as well as give you the recharge your body so needs after intensive athletic exercise. The standard 7-8 hours fall somewhat short when training for a marathon, and really we should be aiming for 9-10 hours. My goal for the next 2 months – more sleep! Electrolytes provide the power you need to carry on, and running causes us to sweat them out. Lack of electrolytes can cause fatigue and cramps, which no runner wants to experience during or after a run. NUUN hydration provides fabulous tablets that dissolve easily in water, do not include sugars, and provide a great natural boost of electrolytes. Post-run coconut water is another wonderful and natural way to replenish your body with electrolytes. I love Amanda’s last recommendation the best: “listen to your body.” If you are in tune with what your body is telling you, you’ll refuel properly and timely, avoiding the snowball effect of incredible insatiable hunger, overeating, or not eating enough. She also recommends to drink water before refueling. You may just be dehydrated rather than craving more calories. Saturday’s 10K is a great local race on a nice flat course. 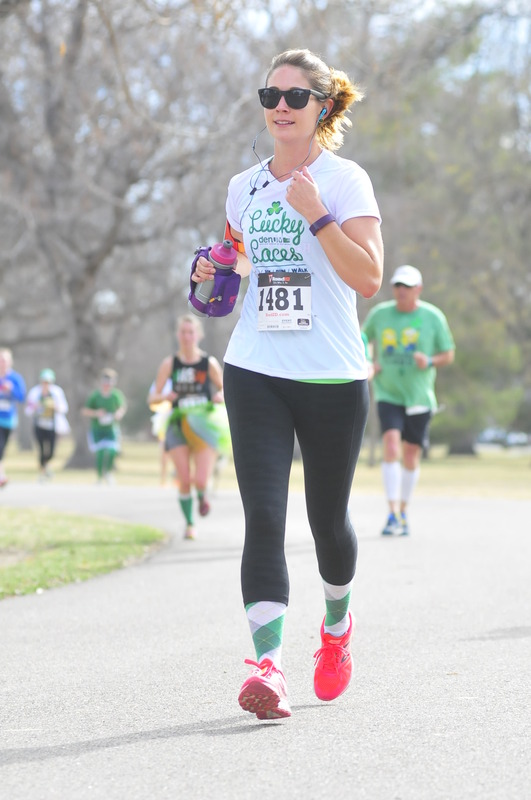 Lucky Laces 10K was a success – nice, easy miles to prep for Sunday! I gave myself a nice running break yesterday, but I will be back at it this afternoon, with 17 miles planned for this weekend – eek! What recommendations do you have for fueling during marathon training? Anyone else experience some major runger? How is your training plan going? Everyone loves a comeback story. What a difference a year makes. Imagine all the possibilities and all the experiences that can occur within 365 days. I guess even more considering we just had a leap day. This past year was a personal challenge for me, and while we all face challenges on a daily (sometimes even hourly) basis, it was a year that really tested my values and my passions. I spent much of this past calendar year working two positions at work, and although I am not in a position to complain about financial stability, the gift of employment, and colleagues who helped keep me sane, it was a real struggle. I am a perfectionist, sometimes to a fault, so not being able to give 100% to either job upset my equilibrium, and ultimately forced me to realize that I had to prioritize. Unfortunately that meant giving up something I love – writing. My blogosphere wasn’t the only thing to be left by the wayside, but at that time it wasn’t adding to my life. Rather, it became a burden, an additional obligation, and that’s never what this platform was meant to be for me. I knew it wouldn’t be a permanent change, yet I had to reach a point where I had the time to dedicate and the satisfaction of writing and sharing my thoughts and experiences. Long story short, I think I am back. 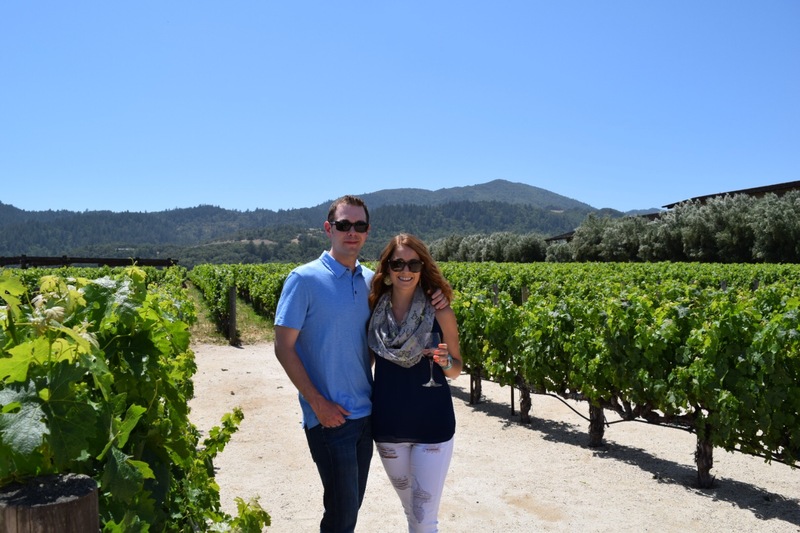 The gorgeous estate at Robert Mondavi. My favorites, however, were Quintessa and Schramsberg! 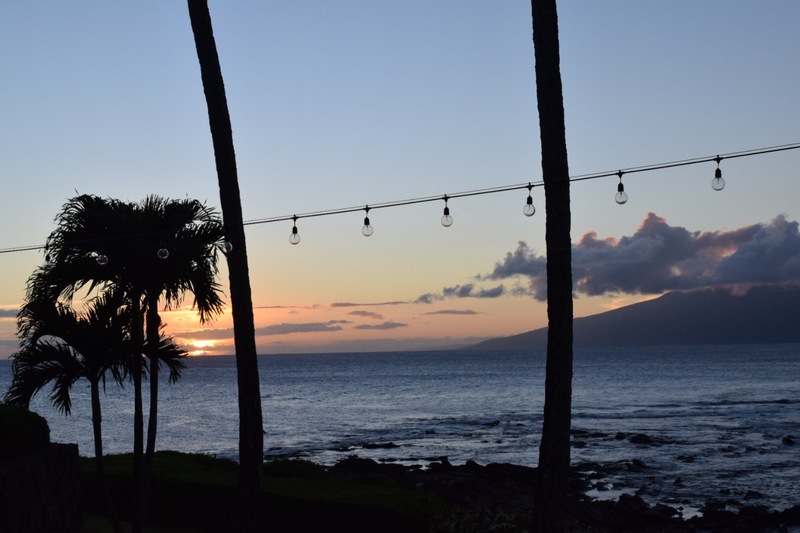 There’s nothing better than a Maui sunset. Absolutely nothing. nicely, and the winter so far has been beautiful and mild. I’ve been baking like crazy (shocker), and have taken up photography (still a lot to learn but I am loving it so far). The biggest news, I think, is that I officially signed up for my first ever MARATHON! There, I said it, the “M” word. It’s been three years since I began my running journey, and I don’t know if I ever thought to myself when I started, “Hey there self, let’s start running so we can eventually run a marathon.” But what motivated runner doesn’t at least once consider the possibility? 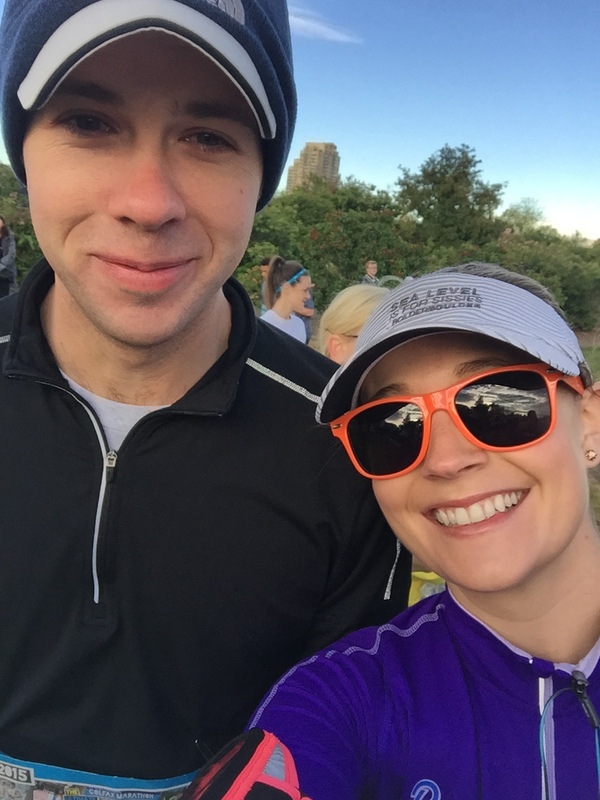 After two of my running inspirations (including my best friend Ms. BakeNBurn) ran the Marine Corps Marathon this past October, I knew it was only a matter of time before I succumbed. During the month of December I simply couldn’t stop thinking about it, and finally, by mid-January, I committed. 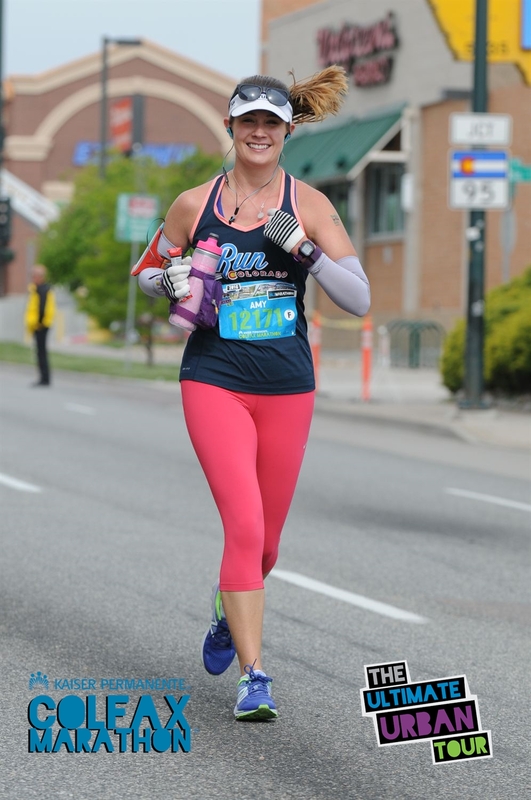 I will be running the Colfax Marathon, Denver’s (currently) only marathon, on May 15th! Get ready Colfax! This year I am coming for you with full force! 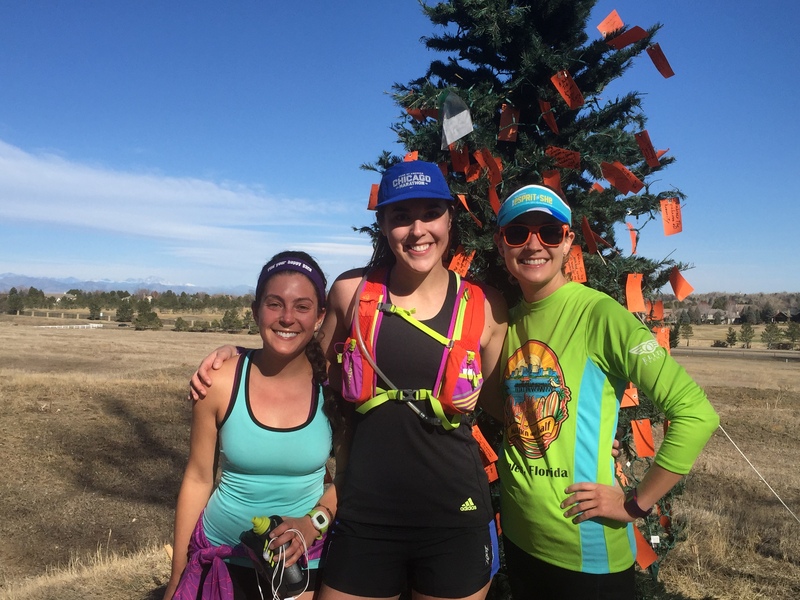 Two of the amazing women and runners I met through Instagram – also both signed up for Colfax! So here’s my hope, for myself and for this blog: to keep writing, to chronicle these experiences, to take whatever inspiration I can find, and to keep this party going. Who’s with me? 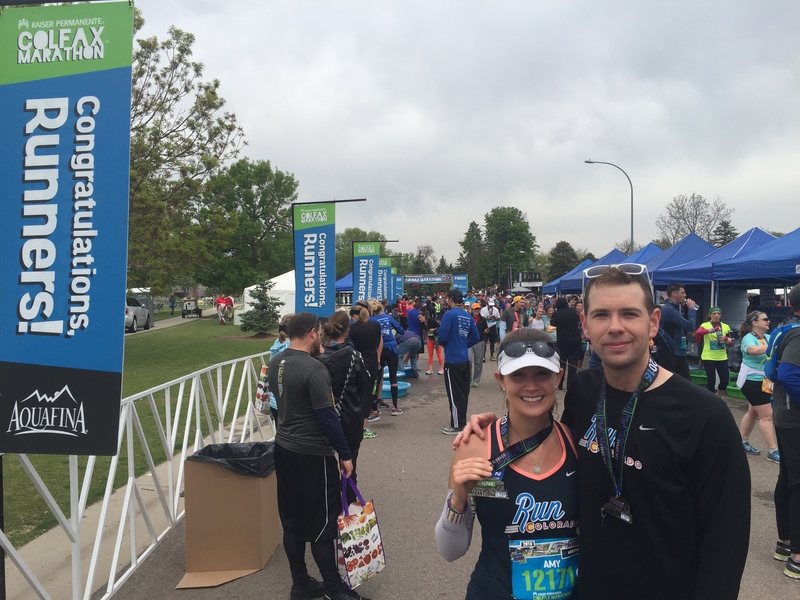 A month ago I took part in my first ever Colfax Half Marathon. The Colfax race series is an institution in the state of Colorado, and has apparently been featured in Runner’s World. 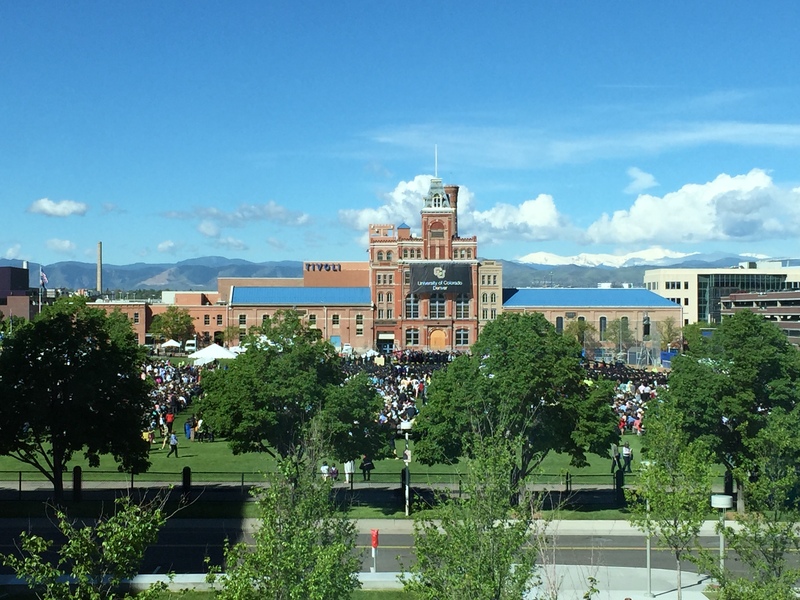 Other than the BolderBoulder, it’s the one “local” race that has really become nationally known. 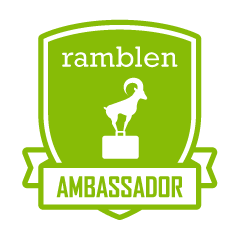 I had been hearing about it since joining the running community three years ago, but hadn’t thought to sign up until this year. 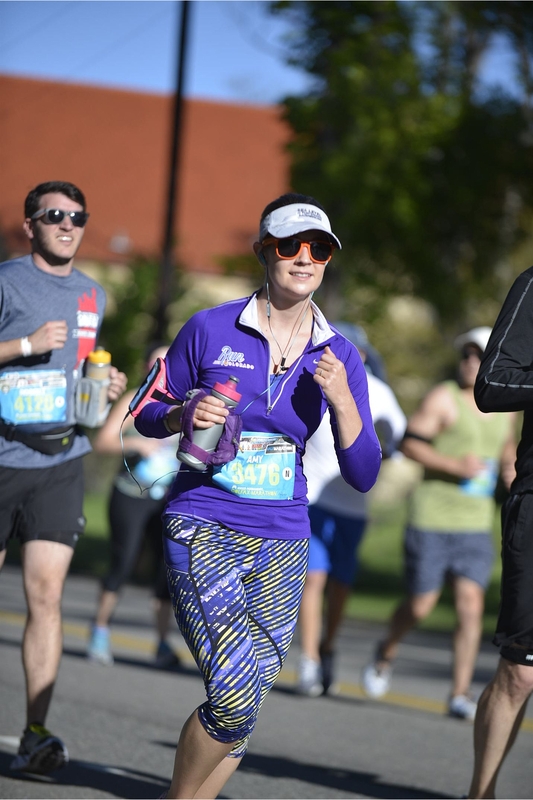 The Colfax has five different options for distances and participation: a 5K, 10-miler, half marathon, full marathon, or team relay. 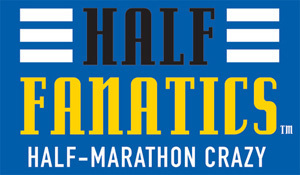 I still have not committed myself to the idea of a full marathon, so I happily signed up for the half. What a gorgeous setting in which to graduate. morning to attend graduation and volunteer for commencement services. Commencement is truly one of the most exciting days on any college campus – the air is thick with accomplishment, promise, and aspirations for the future. It was the perfect day and I was thrilled to be a part of the day. Coolest race expo venue ever! 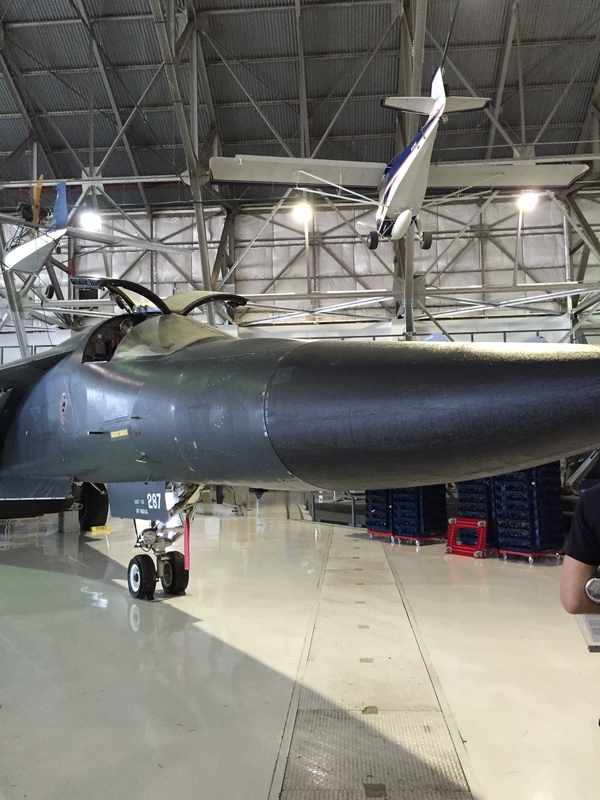 After graduation, I drove out to Denver’s air and space museum (who knew they had one?? ), Wings Over the Rockies in east Denver for packet pickup. This was BY FAR the coolest location for packet pickup. You entered and immediately picked up your bib and race reminder information, then the expo led participants through the massive hanger lined with planes from all eras. It was incredible. My aeronautics-loving husband would have loved this place but I graciously offered to pick up both of our packets on my way home. I stopped by a few booths, including the Run Colorado store (I got the hubs a shirt that read “Run Commando” which he and I both got a kick out of), Bani Bands for some adorable headbands, and a local yoga mat vendor which infuses their mats with essential oils – I got a gorgeous purple mat that smells like lavender! At the end of the expo, I picked up our tech shirts and Colfax 13.1 stickers, and headed back home. The next morning arrived terribly early. Our race start was 6:45am, but it was recommended we park by 6am… oof. Because we couldn’t cross Colfax (I mean, it is called the Colfax for a reason), we parked on the south side of Colfax, about a 15 minute walk to City Park. Denver has apparently had a monsoon season as of recently, so Saturday and Sunday were the first nice days in over two weeks. 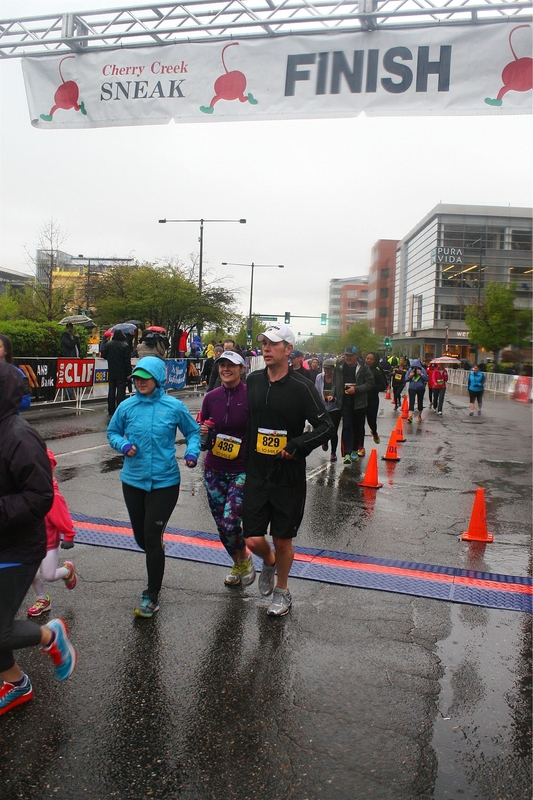 It was definitely a blessing, because running 13.1 in the rain isn’t ideal… I have already done that once before. We made our way over to the far edge of the park near the Natural History museum for the starting line. On our way, we passed a large group of marathoners making their way out of City Park and turning west onto Colfax – that was really exciting to see, but also mildly tiring knowing how much further they were going than I. We were randomly placed into corral N, although we were never asked to provide qualifying times so I am not sure how these corrals were sorted. The first group started at 6:45am on the dot, but by the time it got to our corral, we’d been waiting over 20 minutes, with no space to stretch, and standing on cold pavement. Starting a run cold isn’t really fun, but you persist! 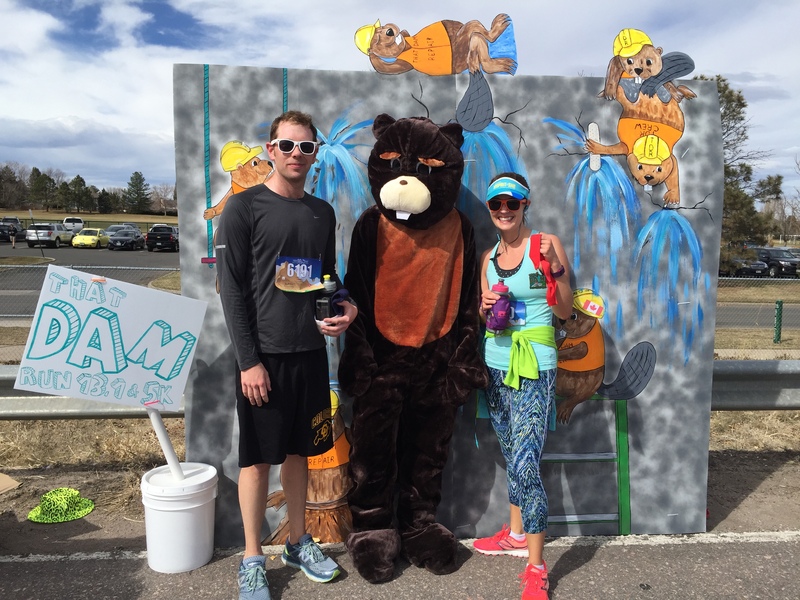 excited for this race – you get to run through the zoo! The volunteers held amazing zoo-related signs throughout the zoo, as we snaked around the winding pathways. It was a little tough this early on in the race, as people were still fairly clumped together, but we got to see camels, flamingos, an elephant, and a sleepy cheetah, along with a number of other animals lazily waking up before the day’s excitement. Once we headed out the facility entrance, we ran east toward the Natural Science Museum, and looped in front of the front doors. Finally the race made its’ way onto Montview Blvd., which is where we would spend the majority of the time running. While the marathoners were heading west towards Sports Authority Field at Bronco’s Stadium, we were heading towards the Aurora Fire Station. After about 3 miles on Montview, a fairly flat, not overly exciting road, we turned right before hitting Havana and loopped into the fire station. Fire fighters and EMTs were waiting there to cheer us on – coming through the other side of the station was an awesome backdrop of the Colorado flag and photographers waiting to shoot. You know I posed for this one. This was a good way to do an out and back, and at least I can say I ran on Colfax! This is my intense face. Shortly afterwards was a Clif gel shot station, water, and a line of policemen and women cheering and clapping. 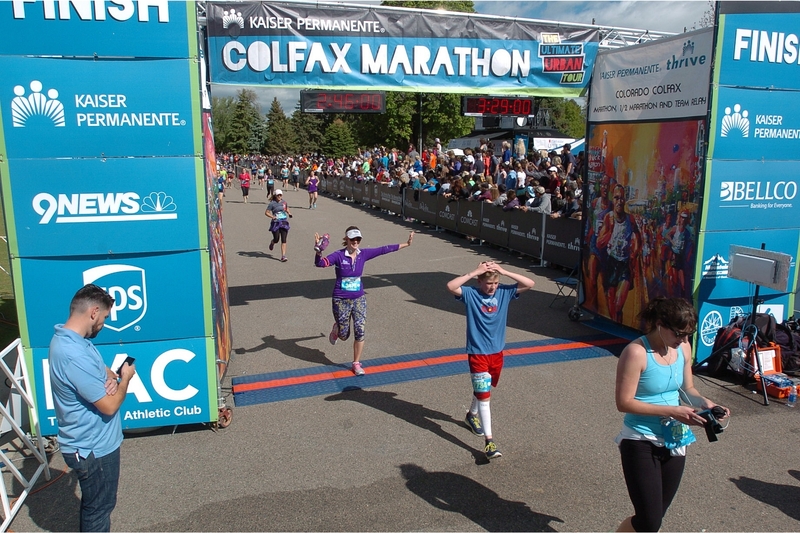 Finally, we emerged onto Colfax – the entire race series’ namesake! Colfax was wide open, and people stopped along the road to cheer and encourage runners. It was nearly 9 miles in at this point, and the time of the race when you need a little more pep in your step, so the enthusiasm was truly welcome. After a good stint heading west on Colfax, we turned right and made our way onto 17th Avenue. Shade was seriously needed because the day was warming up and I hate disrobing in the middle of a race. On 17th, you pass by gorgeous, stately homes, families in their yards with sweet signs, half dressed firemen from the Denver Fire Fighters Calendar, and a whole lot of shade. It was the best last 3 miles a girl could have hoped for. This stretch takes you all the way back to City Park. Coming up on the park was so exciting. You turn right and follow the loop around the western edge of the lake, hurtling towards the finish line, with the marathoners finishing next to you. I *barely* had a half marathon PR, literally by 6 seconds, and felt amazing running through that finish line. Would I do this one again? Heck yes I would! Don’t you love that feeling of victory? Another half in the books! The hubs met me at the finish line, and we waited in the amazing post-race vendor area to find a friend who had participated in the relay of the marathon. It was a gorgeous day, and a great way to start the summer. I am so lucky to live in such an amazing city! Wahoo! Gotta love some bling! And it spins! I cannot lie to you, the internet, or myself. The past few months I, for some unknown reason, loathed running. 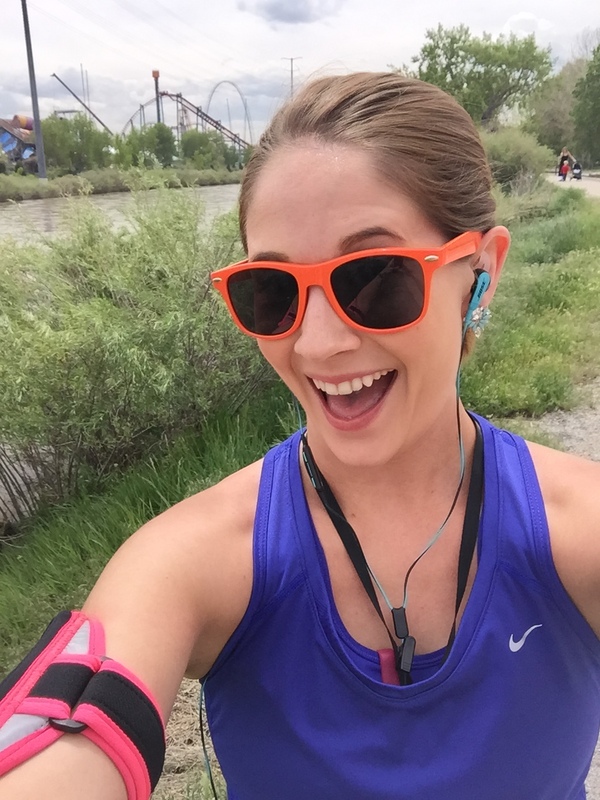 It seems odd as running was the activity that really brought me into the world of fitness to begin with, but I just didn’t have the desire or drive to hit the pavement or trail. My running shoes were feeling severely neglected as I sought other means of fitness. Granted, it is always good to switch up your routine and workouts, to help balance the toning of all of your muscle groups and to make sure you stay committed, but this was getting a bit dire. 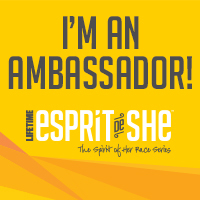 Especially because I had signed up for a race through work, and needed to commit to doing it with coworkers, and my boss, as other race participants. You can’t tell the Vice Chancellor you didn’t feel like representing the university because you haven’t wanted to run. Well, technically I guess I could, but I surely didn’t want to. Probably my last good run before the race was early April, and it was only 5 miles! Earlier in the year I had heard about the Cherry Creek Sneak through a chain of work emails sent out to fellow running colleagues. This is a local race that boasts 4 different distances for the runner in all of us: 10 miles, 5 miles, 5 kilometers, and 1.5 miles. The event takes place each April in one of my favorite areas of Denver, Cherry Creek. It’s an old, established area of Denver with gorgeous stately homes and quaint, older cottages. It’s eclectic and charming, and a gorgeous area to run through. Being that I had signed up for the Colfax Half Marathon, which would take place less than a month later (AH! This Sunday! ), I thought it best that I register for the 10 miler. Once the hubby said he’d join me, I was committed. So March rolled around, I kept on running, but was just not happy with it. March turned into April, and my mood hadn’t changed. Part of it, too, was that I was so in love with Core Power Yoga and the Tone it Up workouts, that running didn’t seem quite as appealing. So finally the weekend of the Cherry Creek Sneak arrived, and rain was in the forecast. 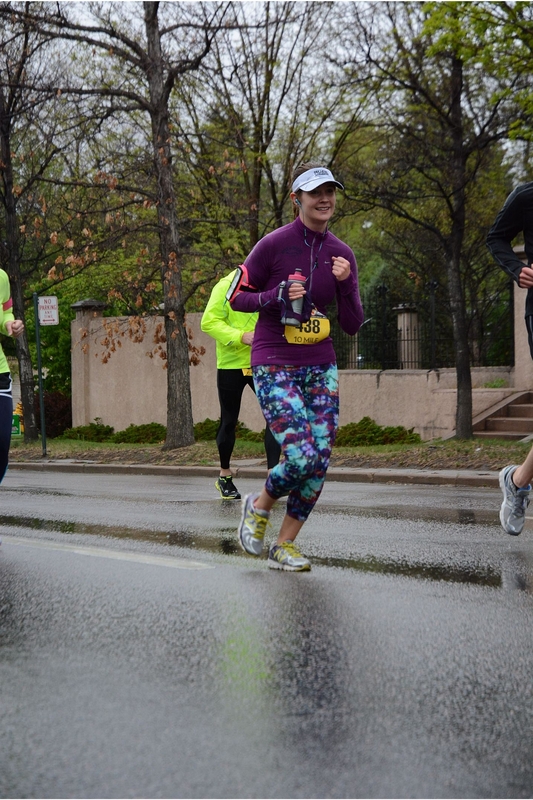 If you haven’t kept up with Denver weather (let’s be honest, it’s a fascinating and ever-changing subject here), it rained for over a week straight, with about 3 inches of snow by the end), and I was truly dreading the race. Sunday morning I woke up feeling groggy, tired, and just not in the mood to run. But I am not one to back down from a commitment. So with a sense of foreboding, I dressed for the race and hoped for the best. The hubby and I found a spot to park and walked a few blocks towards the starting line. The 10 milers started first at 7:30am, so we arrived with about 20 minutes before the start. I searched around for my colleagues, but didn’t see anyone. Eventually we just readied ourselves for the race, lining up in our time corral, and prayed for a decent 10 miles. This was not my most optimistic start, to be sure. After one of the best race-day national anthems ever, we were off! 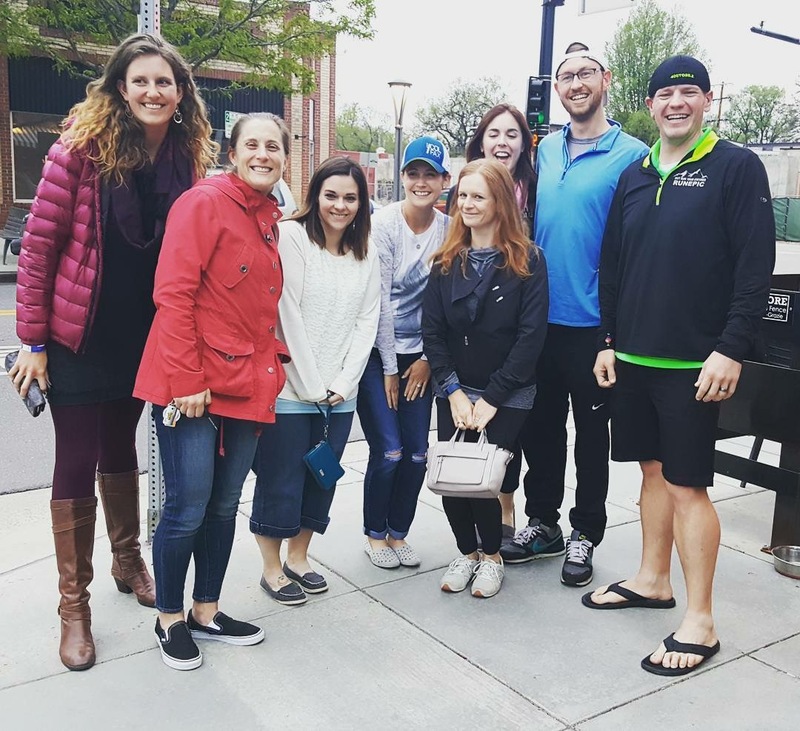 Luckily the rain had held off to start, and we made our way from the east side of the Cherry Creek Mall toward Colorado Boulevard, and then looped back toward University Boulevard. We ran to the northwest corner of the mall and turned left onto 1st Avenue. We’d already gone 3 miles at this point, and I was feeling pretty good. Time was passing quickly, it was the perfect temperature for running, and I was actually enjoying myself! Before the rain descended upon us, the race was going really well! 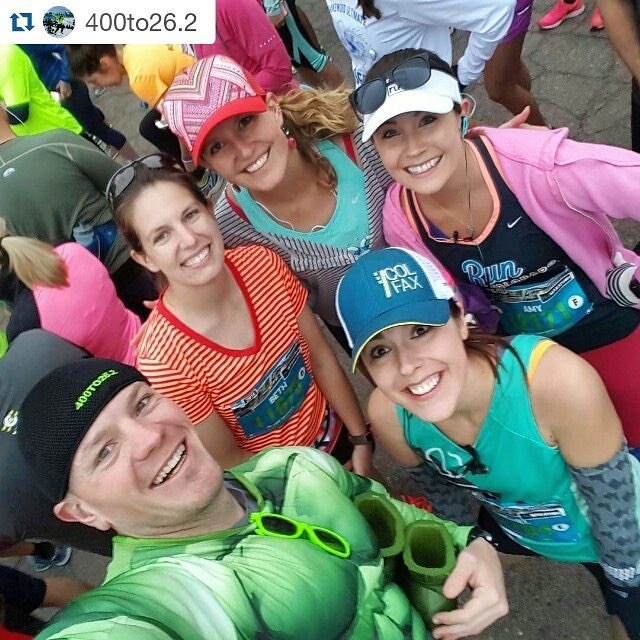 times (and happy runners). We got up the hill and turned right onto 6th Avenue before making our way toward Cheeseman Park. Any Denverite knows that the city is spattered with local parks, trails and greenbelts. Given my race history, I am most familiar with Washington Park, City Park, Central Park, Confluence Park and Sloane’s Lake. I had never before been to Cheeseman Park. The park includes an outer trail which loops in an oval around the perimeter of the park. It is a gorgeous space with a beautiful pergola and amphitheater along the eastern edge of the park and large trees all around. Feeling damp, but still happy! longest mile of the entire race, because this is when it really began raining steadily. The temperatures dipped and it felt like we were never going to turn around. Police officers lined the streets, and truly I felt for them, having to stand out there until all the 10 milers ended. At least I was moving! Making it to mile 8 was a huge feat, and at that point I realized my legs still felt great and I could make it. The cold rain was not ideal, but two miles is a drop in the bucket in the grand scheme of things. We made our way back to 1st Avenue, which led us straight past the mall and toward the finish line. My only complaint is that the 5k participants were finishing at the same time, and were primarily walking in large groups, which made running around them very difficult. The finishing area, as a result, was rather bottle-necked and confusing. Robbie and I sprinted the last tenth of a mile toward the finish and were instantly slowed by walkers. I was hoping for a much more triumphant finish, but I did it. YAY THE END! It’s always the best part of every race. Immediately afterwards we grabbed water, a half a Panera bagel, and delicious banana, and made our way straight to the car. It wasn’t worth trying to find folks. The 5 milers were set to begin at 9:35am, and their whole five miles ended up being rainy and cold. I’d prefer 10 miles with 3.5 miles in the rain, than 5 miles entirely in the rain. Thankfully the hubs is BRILLIANT and brought towels to wrap around ourselves in the car, and turned the seat warmers on high. Rain and cold aside, this race was fabulous, and I am happy to report it was just what I needed to regain my love for running. I am SO excited for this weekend’s Colfax Half Marathon, and I look forward to the BolderBoulder the week afterwards. This month I got my running drive back! It just goes to show you, sometimes you need to step away for a little while to rediscover why you love it in the first place. The hubs is so wise, and at the beginning of April he told me to just take a break from running and focus on my other pursuits. I did just that, and after the Cherry Creek Sneak, I have been running almost every weekday during my lunch hour and feel so refreshed. So here’s to the next run – no one run will ever be like another, so take the time to appreciate the journey! Ever just have a running slump? What did you do to get out of your running rut? Anything you recommend to keep your runs happy?